Venturing from our home, through the heart of Durbanville winelands, you’ll arrive at an award winning boutique winery whereupon you will be treated to a demonstration on the art of sabraging champagne, learn about the winery and taste how their unique terroir beautifully pairs with our oysters. 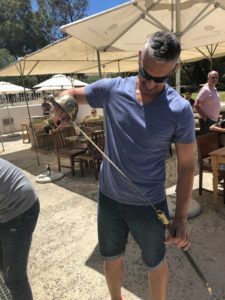 We will then return for an experiential journey in which you will be taught the skill of shucking oysters and cleaning mussels; followed by a taste sensation seafood braai. 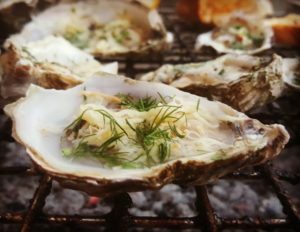 Fish braai : Speciality seafood; fresh oysters, creamy mussels, braaied fish, sweet potatoes, homemade bread and salad, rooibos tea / coffee or water. Guests will need to provide their own transport to and from our home in Durbanville. Water, Rooibos tea and coffee will be provided; however guests can bring other drinks or purchase wine from the farm.